Pool Tiles pattern is written for a single square. Each square measures approximately 6”x 6”. Squares can be combined to create various finished projects: singles for coasters, six for a placemat, nine for a pillow cover, various combinations for table runner, etc. 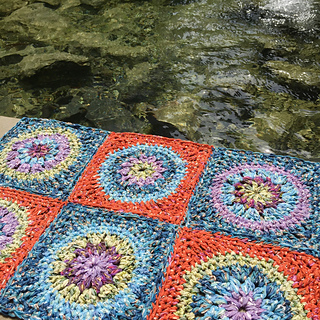 The ribbon yarn is perfect for this project and lends a shimmering effect that is reminiscent of colorful tiles in pool water.